Artisan Vegan Pizza is a very creative collection of cruelty-free pizza recipes. Joey Avniel has thoroughly explored vegan pizzas, with a view to encouraging people at any level of ability or interest to try his recipes or incorporate some of his principles into pizza making. He argues that not every vegan ingredient is a healthy one, and therefore he has developed several gluten free, soy free, sugar free organic recipes with health in mind. The recipes are clearly written and they cover a range of different cuisines other than Italian ingredients. Non Italian types of pizzas include Mexican, Thai, Indian, French, Greek, Middle Eastern and Turkish variations. 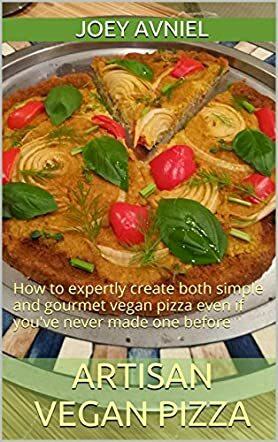 The basic principles of healthy vegan pizzas are explained at the start of the book, where the importance of cooking for longer time but in slow heat is emphasised, to preserve the nutritional value of the food. Several of the pizza toppings described are raw, so that no decrease in nutritional value occurs on cooking. The book features appetising recipes for vegan pizza bases, sauces, and cheeses, and these are written separately to allow readers to combine them creatively. Each of these is nutritious and appetising. There are extensive recommendations on spices to add to sauces and bases. Even if readers don't always have time to make crusts or pizzas, the vegan sauce and cheese recipes would make excellent dips and sandwich fillers that could be made and stored. The recipes are particularly useful for people interested in recipes for cooking with a dehydrator. For those under time constraints, there are also instructions on using portobello mushrooms and zucchini as pizza crusts. Other interesting crusts are focaccia, sourdough, quinoa, and legume and green crusts. For sauces there are interesting recipes based on tomato, avocado, squash, bean, dhal, and tzatziki, to name a few. For vegan cheese recipes, there are several variations, such as cashew, chickpeas, almonds and coconut. The book also features a short introduction before each recipe, with anecdotes on the recipes. I highly recommend this book to vegans and non vegans alike.